Have you ever tried Lebanese baked eggplant? Also known as “Sheik ‘al Mishee” (or “Sheik ‘al Mehshe”), which translates to “Dish Fit for a King.” And it really is that good. You start with eggplant, which is broiled until brown and then baked until soft. 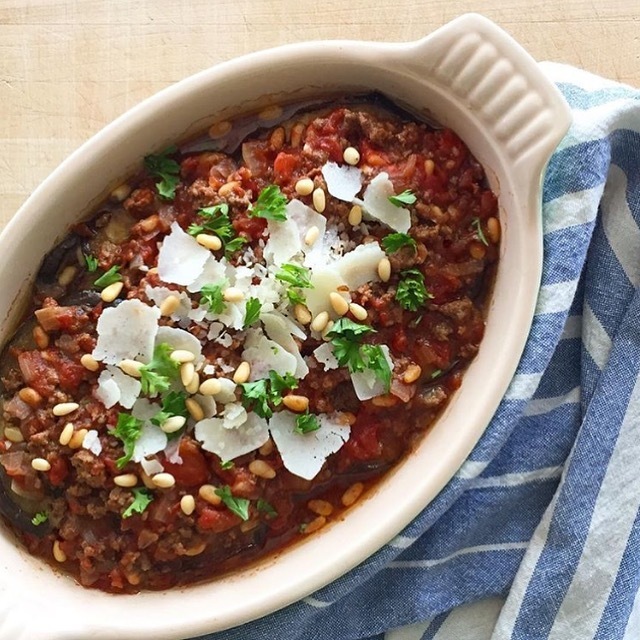 The eggplant is layered with ground beef and a rich tomato sauce, seasoned with plenty of onion, garlic and cinnamon and topped with nuts. And oh my goodness, all together the flavors are divine. It’s a bit like Greek Moussaka, except no béchamel sauce or breadcrumbs needed. So it’s easier to make than Moussaka, and also happens to be gluten and grain free. Dairy free, too, if you omit the butter and the Parmesan garnish. My husband’s Aunt Lanie, who is Lebanese, made it for us years ago and I’ve longed to recreate the dish on my own ever since. Finally, here is my recipe, adapted from this one and a few others in some old Church cookbooks. (Church cookbooks hold so many treasures, don’t they?) Let me know if you get a chance to try it :) Would love to hear how it turns out! Cut eggplant, cross-wise, into 1/2 inch thick circles. Place eggplant circles on the parchement-lined baking sheet. Drizzle the top side with olive oil. Place in the oven and broil until golden brown. Flip eggplant, drizzle with olive oil, and broil again until the other side is browned as well. Remove from oven and set aside. Add the ground beef to the pan with onions and garlic, breaking up the beef into small pieces with a wooden spoon. Add 1 teaspoon cinnamon, about 1 teaspoon salt and a few grinds of pepper. Cook, stirring frequently and continuing to breaking up beef with the spoon. When beef is done (browned and cooked through), add tomato sauce and nuts; stir to combine. Simmer over medium heat for a few minutes, then taste and add additional salt and pepper if needed. Turn off heat and set sauce aside. Preheat oven to 375 degrees. Grease the sides and bottom of a 9 x 13 x 2 casserole dish with olive oil. (Sometimes I use two oval bakers instead, as pictured below.) Place about 1/3 of the meat sauce in the bottom of the dish and spread around. Place eggplant slices on top of meat sauce, overlapping the pieces slightly as needed to cover the bottom of he dish. Pour about the same amount of meat sauce on top of the eggplant, and spread around. Then add a second layer of eggplant as you did the first. Pour remaining meat sauce on top of second layer of eggplant. Cover dish tightly with foil and bake for about 45 minutes. Remove foil and let cool for a few minutes. Add garnishes and serve! Baked eggplant goes well with yummy hummus, perfect white rice, tabbouleh, and/or a simple salad and pita bread.